San Francisco, like many other areas of the country, is facing an unprecedented budgetary crisis. However, proposed budget cuts to the Public Defender’s Office threaten to exact a toll on The City that would greatly outweigh their modest fiscal benefits. More than 45 years ago, the U.S. Supreme Court handed down a landmark decision in Gideon v. Wainwright, which found that “lawyers in criminal courts are necessities, not luxuries.” The court concluded that governments have an obligation under the U.S. Constitution to provide legal representation for people charged with a felony who cannot afford to hire their own. Soon afterward, the court extended Gideon, applying the right to juvenile delinquency cases and to misdemeanor cases where imprisonment results. This right to counsel is now accepted as a fundamental precept of American justice, yet is often implemented in ways that betray the great promise of Gideon. Only days ago, Attorney General Eric Holder said indigent defense services are in a state of crisis in our country. We co-chaired the Constitution Project’s bipartisan National Right to Counsel Committee. Its members are individuals with expertise in every relevant part of the criminal justice system, including prosecutors, judges, victim advocates, defenders and scholars. In “Justice Denied: America’s Continuing Neglect of Our Constitutional Right to Counsel,” the committee unanimously concluded that this country’s indigent defense system is in crisis, that the government’s obligation to provide lawyers in these cases has for too long been ignored and that it cannot be ignored anymore. We issued 22 urgently needed recommendations for reforms, which we urge San Francisco to adopt. Our recommendations are not just a matter of what the U.S. Constitution requires, they are also a means to conserve limited resources. Public defenders who are well trained and have the necessary resources can help ensure that a criminal trial is properly conducted and lower the chance of costly appeals. These public defenders can lessen the likelihood that innocent people will be wrongly convicted while the true perpetrators remain free, continuing to victimize society. 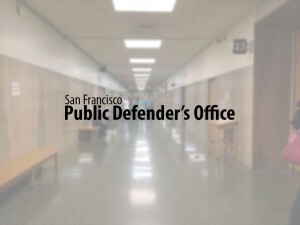 Every year, San Francisco’s public defenders represent more than 28,000 defendants, each handling a caseload that is two to three times what a private attorney would reasonably be expected to manage. Public defenders work extraordinarily long hours and, unlike other public servants such as police officers and firefighters, they are not paid any overtime compensation. With such burdensome caseloads and work hours, the resources of the Public Defender’s Office are already stretched far beyond any reasonable limit. Any potential funding cut would only exacerbate the situation. The proposed budget cut will also disproportionately affect minorities, who are most likely to need appointed lawyers. Compared to white defendants in San Francisco, blacks are 4.7 times and Hispanics 2.1 times as likely to need a public defender. America’s criminal justice system is a model for the world. It contemplates defense lawyers who serve as the primary safeguard against the risk of wrongful conviction. It contemplates that the quality of justice should not be determined by the amount of money a criminal defendant has. The Sixth Amendment serves not just an individual charged with a crime, but all of us. San Francisco is facing extraordinary budgetary pressure. However, the public defender model is the most cost-efficient way to fund this essential right to counsel. It appears that the Board of Supervisors’ Budget and Finance Committee recognized this when it voted to restore part of the office’s funding rather than to outsource cases to private attorneys. However, the restoration of these funds will leave the office $1.3 million short of its proper funding level and will still require the office to withdraw from cases. Failing to fully fund the office will not only cost The City more in the long run, it will betray one of the U.S. Constitution’s most fundamental rights. Rhoda Billings is a former chief justice of the North Carolina Supreme Court, Robert M.A. Johnson is district attorney for Anoka County, Minn., and Timothy K. Lewis is a former judge on the U.S. Court of Appeals for the 3rd Circuit. The authors are co-chairs of the Constitution Project’s National Right to Counsel Committee.